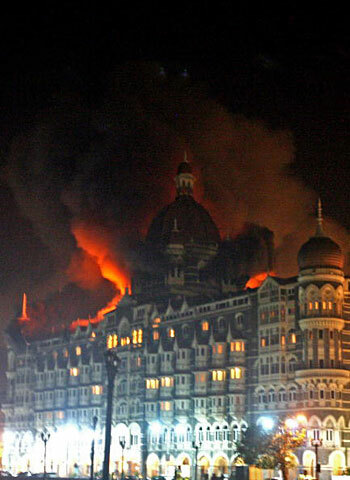 On the night of November 30, 2009, a mere four days after the first anniversary of the terrorist attack on Mumbai’s Taj Majal Palace and Tower, hotel executives sat down for dinner at two of Taj’s newly-reopened restaurants, the iconic Harbour Bar and its upstairs neighbor, Wasabi. Despite the gala surroundings, it was a somber affair, befitting the tragedy that had played out in the hotel a year earlier, as four Punjabi terrorists rampaged through the rooms, killing guests and staff and setting fire to the jewel in the crown of the Taj Hotel empire. One hundred seventy two people died in attack on the city, which has been called India’s 9/11; 141 of them were massacred in the train station, the streets, and a Jewish Center, and 31 in the four-day siege on the hotel. But the restaurant’s reopening was also an important symbolic gesture, both for a city whose confused response to the attack had been widely criticized and for Ratan Tata, the 72-year-old chairman of the Tata Group, which owns the hotel. Following the disaster, he vowed that the hotel and its restaurants would re-open in one year. “We will move forward and not look back,” he told his staff. 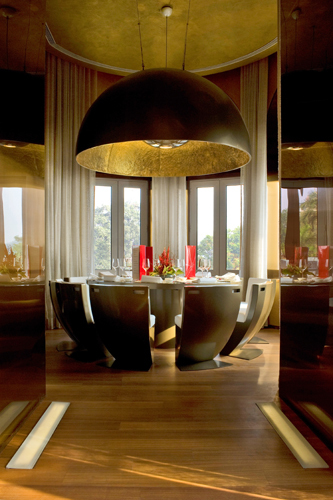 “The amazing thing was, that the terrorists attacked architecture, and the Taj was using architecture as one of the elements to help the healing,” says Diego Gronda, the creative and managing director of Rockwell Group’s Madrid-based European office, which redesigned both the Harbour Bar and Wasabi, master chef Morimoto’s Mumbai outpost, which was credited with first bringing Japanese cuisine to India. The Harbour Bar, the first restaurant in India to secure a liquor license, was particularly damaged. According to London’s Sunday Telegraph, the room had been the site of a gun battle between Indian commandos and the terrorists, and the walls were peppered with bullet marks and shrapnel from grenades. Wasabi had suffered extensive fire and smoke damage. Days before the attack, New York-based Rockwell Group had been discussing a major master plan of the whole property. Gronda himself had been in town to present some aspects of the plan. But all that was put on hold in the face of the larger challenges before the hotel and its staff. Instead, Gronda and his team raced to develop plans for the restoration of the two restaurants. Wasabi proved simple: “We presented our design and got approval in 15 minutes,” Gronda says. But the Harbour Bar was another story. “Everybody in Mumbai had a partial vision of the bar,” Gronda says. Since it opened in 1933, hotel guests and Mumbai residents had celebrated significant occasions in the space. People fielded marriage proposals, toasted big business deals, and celebrated special events at its tables. Over the course of its history, the restaurant had had four separate incarnations–originally as a glam Art Deco performance space, with a piano, and most recently as a nautical bar, with diving bells as decor. Each era had its adherents, making consensus around a new design difficult. Dominating the space is a bar made from a huge chunk of marble from Udapur, which replaced the original wooden structure. Despite being new, looks as if it’s been there forever, which was exactly the point. On the walls are pieces both by Indian masters, and by their protégés, another deliberate nod to continuity. “We thought it was important to establish a sense of pride in India’s heritage, as a way of continuing the symbolism of rebirth,” Gronda says. The Harbour Bar now houses close to $1M in art. The major overhaul also allowed the Rockwell Group to raise the level of the floor enough that guests could actually see the Gateway of India harbor, a feat not possible in the old space, despite its name. The restoration of Wasabi was less emotionally fraught, but equally demanding. The restaurant, which is one floor above the Harbour Bar, and accessed from its entryway, had previously been reached via an ugly spiral staircase. Gronda replaced that with a dramatic red staircase, that looks like it had been crafted out of origami. There’s no signage, but Morimoto devotees will recognize that the road to the master’s omakase begins with the route mapped by his signature color. Upstairs, Gronda decided to take one smallish space in the room, in a turret in the corner, and turn it into a private dining room, as well as a dazzling beacon for the hotel. He installed an enormous bronze-clad domed lamp, that was forged in India, traveled to Denmark for further crafting, then on Poland for finishing, and hung it over a round table that seats eight. “It’s the only point that you can see from the entrance to the hotel,” he says. It’s become signage for the hotel, and quickly established itself as the hottest table in town. space. Ultimately, they did much of the work off-site and then installed it over the course of two and a half months. People worked round the clock, he says, with some workers sleeping at the hotel so they wouldn’t have to waste time traveling to their homes.